The mischievous genius. It’s the leader of lite-ness and the original EVA all-star, the uncompromisable Jefferson. Like any reigning ruler of the ring, the Jefferson encompasses all of the fine features that you’d expect from a Native shoe. It’s shock absorbent, odor resistant, hand-washable, and comes in an infinite assortment of colors and treatments. Capabilities clouds could only dream of. EVA shoes can be hand-washed using mild soap and baking soda. Wash with a cloth or soft brush and let dry in a cool shaded area. Never put your shoes in the washing machine, dryer, or dishwasher! EVA shoes are heat-formed, so they can be heat-deformed. We advise on our product tags to store shoes away from direct sun or heat, as they can warp due to the EVA composition. We also advise against leaving them in hot cars. 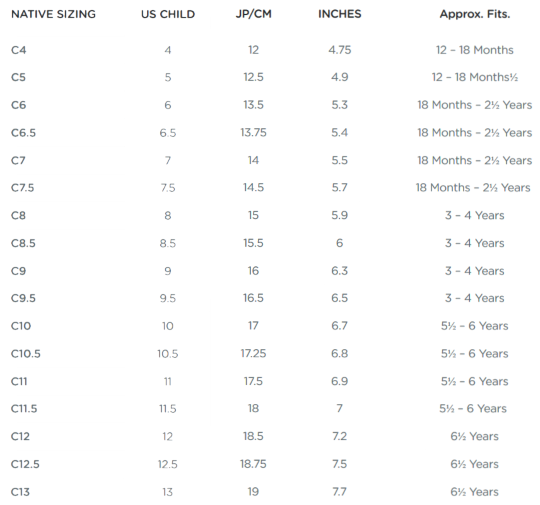 Please Note: Well.ca Customers have reported sizing tends to run small.